I'm trying to find enough players in/around Munich to run a BB7s league. I recently stumbled upon this forum and I though some of you guys might be interested. P.S. : I read/speak and understand German. However, if I was to write it your eyes might bleed. Blood Bowl sevens. You play on a smaller pitch with 7 players instead of 11. The games are much shorter which is the main reason these rules exist. By the way, if anyone does not know BB7 and wants to try it, I'll be happy happy to organise some test match for you to try it. You guys will love it. The Drakkar Bowl 7’s pitch is 20×11 squares, smaller than a normal Blood Bowl pitch. 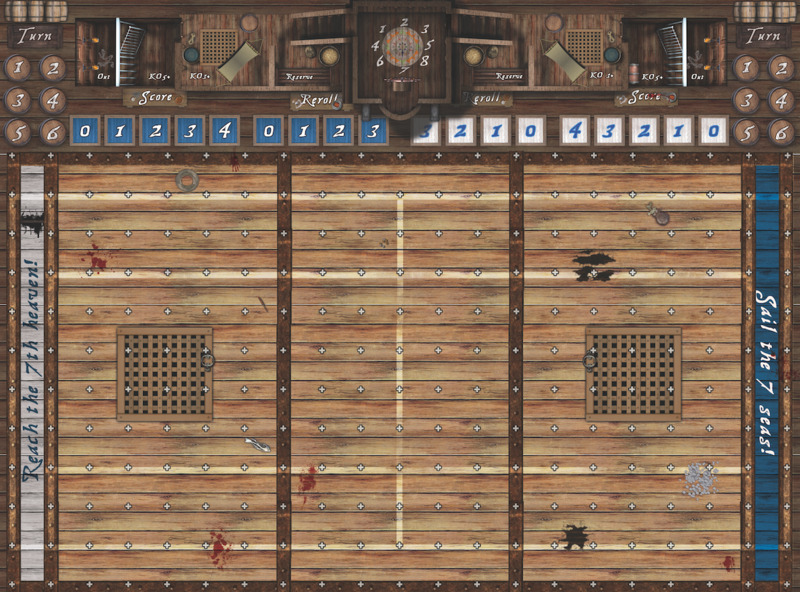 The game is played on the deck of a drakkar boat (special rules apply). Instead of one, there are two Lines of Scrimmage spaced apart from each other, and no wide zones. See the dark brown lines on the illustration. The Viking Brawl 7’s pitch is 20×9 squares, smaller than a normal Blood Bowl pitch. The game is played on the deck of a drakkar boat (special rules apply). There is a Line of Scrimmage and the wide zones are only two squares wide. See the dirty white lines on the illustration. Drakkar Bowl. DB7: In DB7, the teams set up apart from each other before a kick-off. Each coach must set up 7 players between their End Zone and their own Line of Scrimmage. At least 3 players must be set up on the team’s Line of Scrimmage. The kicking player always sets up first. If a coach cannot field 7 players, the coach must field as many as possible. Viking Brawl. VB7: In VB7, the teams set up well in contact before a kick-off (like in BB11 but on a smaller area). Each coach must set up 7 players between their End Zone and the Line of Scrimmage. At least 2 players must be set up on the team’s Line of Scrimmage and and at least 3 players must be in the center zone. A maximum of 1 player can be set up in each wide zone. The kicking player always sets up first. If a coach cannot field 7 players, the coach must field as many as possible. The game rules are substantially the same as in regular Blood Bowl, except for the changes noted below and above. These rules assume that you are using the Blood Bowl rules from the Competitive Rule Book (CRB) or Living Rulebook 6. NUMBER OF TURNS: Each half of the match lasts 6 turns. DB7 or VB7: If the two coaches cannot agree on the type of game they want to play. The winner of an arm wrestling contest between the two decides. I suppose we could add the street bowl pitch for rolo, here. POST-MATCH SEQUENCE: The post-match sequence is slightly altered. Winnings and Fan Factor are calculated as usual. Furthermore, the rules for Journeymen have been changed. JOURNEYMEN: If you end the post-game sequence with less than 7 players available for the next match, you receive free Journeymen until you are able to field 7 or more players. CONCEDING: A team that concedes a game gives up its winnings or MVP to the opposing team. The opposing team also receive two additional TD (no SPP). A game might still be a victory for the team conceding if they had 3TD advantage or more a the time of conceding. Starting teams are purchased from a balance of 600 ᛞ (a Drakk abbreviated ᛞ worth thousand gold pieces in the LRB) + TB (Tier Bonus see below). A team roster consists of a minimum of 7 players and a maximum of 10 players. Players cost in ᛞ the equivalent of their cost in gold pieces in the LRB (conversion rate is 1/1000). For example, an Amazon linewoman cost 50 ᛞ and a Gutter Runner 80 ᛞ.
DB7 and VB7 are really difficult sports (It’s Blood bowl on open sea). To represent that, rerolls cost twice the amount of ᛞ than their cost in gold in the LRB. For example, the Empire (Human) reroll cost 120 ᛞ. Also the life on a drakkar is pretty hard, so pom-poms and assistant coaches are paid double (each cost 20 ᛞ). Furthermore, at least half of the players on a team (rounding down) must be amateurs, as detailed in table below. An amateur is any player that you could field 0-16 or 0-12 of in normal Blood Bowl. If a team roster does not contain the required amount of amateurs, players must be hired or fired to satisfy the requirements (Journeymen count as players). Tier 1: Amazons, Bretonnia, Chaos Dwarves, Dark Elves, Dwarves, Lizardmen, Norsca (Norses), Orcs, Simians, Skaven, Undead, Wood Elves. Tier 2: Alliance, Chaos Renegades, High Elves, Empire (Humans), Khemri, Necromantic, Sea Elves (Union). Tier 3: Daemons of Khorne, Chaos, Nurgle’s Rotters, Kislev Circus, Underworld Denizens, Vampires. Tier 4: Goblins, Halflings, Ogres. ALLIANCE: All human teams can unify to demonstrate the superiority of the human race in Drakkar Bowl. An alliance coach can pick in all five human nation rosters (Amazon, Bretonnia, Empire, Kislev and Norsca). Each reroll cost 120 ᛞ. The half amateur rule still apply and additionally each nation of the humans can only represent a fourth of the team (rounding up). For 7-8 players - max 2 players of 1 nation. For 9-10 players - max 3 players of 1 nation. Tier 1: Additional 50 ᛞ. Possibility to purchase a simple skill for 20 ᛞ. Tier 2: Additional 100 ᛞ. Possibility to purchase two simple skills for 20 ᛞ each.One of the simple skills can be replaced by a double skill costing 30 ᛞ. No player can receive more than one skill. Tier 3: Additional 150 ᛞ. Possibility to purchase three simple skills for 20 ᛞ each. Two of the simple skills can be replaced by a double skill costing 30 ᛞ. One player can receive more than one skill for an additional 10 ᛞ cost. Tier 4: Additional 200 ᛞ. Possibility to purchase four simple skills for 20 ᛞ each. Two of the simple skills can be replaced by a double skill costing 30 ᛞ. One player can receive more than one skill for an additional 10 ᛞ cost. A stat increase can be purchased (+1 MA for 40 ᛞ, +1 AR for 50 ᛞ, +1 AG for 60 ᛞ and +1 ST for 70 ᛞ). Money in a team’s Treasury does not count towards Team Value. 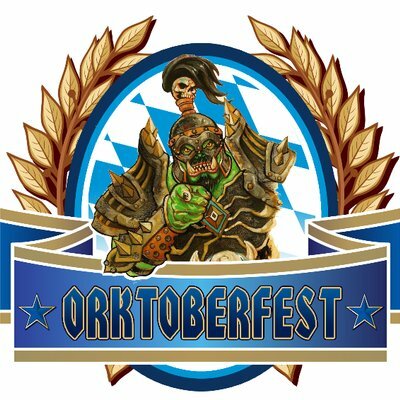 Few inducements can be purchased: namely Meteo/Weather Mage for 30 ᛞ, Bloodweiser Beer Fass for 50 ᛞ, Bribe for 100 ᛞ, Extra Team Training for 100 ᛞ. Mercenaries and Star players can be purchased (as freebooter only) in ᛞ at 1.5 time their normal cost in gold. Vikings do not believe in healers. If the players are not strong enough to survives by themselves they do not deserve life. This means that no apothecary, igor or healer can practice his craft on a drakkar. Master chefs in the navy, really? If these exist they are automatically recruited (willingly or not) by the captain. Vikings think that magic is for the weak and slow witted. No Wizard can be found (alive) on a Drakkar boat. However, this does not apply to Weather Mages which have a quite useful skill all in all. A the end of your turn, your weather mage can, once per game, reroll the weather 2D6 Dice and can apply a +/-1 modifier. This new weather lasts until the end of your next turn or until a new weather thow is done. Going for it: Due to pitching and rolling on the boat, going for it is more difficult. The first GFI is a success on a 2+, the second on a 3+ and the third (sprint) on a 4+. Additionally, only the central third on the pitch is normally stable. To represent this, any GFI attempted outside said zone (area not having a hatch in the illustration above) will apply a -1 modifier. Injuries and casualties: The wooden floor makes for soft falls. For this reason, the 2D6 injury and D68 badly hurt rolls are modified. Note that all 8+ injury roll give the SPP of a casualty. However, vikings do not believe in healers. If the players are not strong enough to survives by themselves they do not deserve life. This means that no apothecary, igor or healer can practice his craft on a drakkar. 12 : Badly Hurt - Out Box and roll a D68 badly hurt roll shown below. Passing: Due to pitching and rolling on the boat, pass are slightly modified. Passing ranges are measured in squares and not with the pass template. A quick pass is 2 squares, a short pass is 3–4 squares, a long pass is 5–6 squares and a long bomb is 7–8 squares. The squares are counted by your opponent as if the passing player was moving, except that the shortest possible route available must be chosen. Any opposing player on a square along this route is eligible to attempt an interception, subject to the normal restrictions for attempting interceptions. Throw-ins: When the ball scatters or bounces off the pitch it is immediately thrown back in by eager sea men and women. Place the ball on the last square it crossed before going off. Throw a D6 to determine the direction (from the crowd perspective): 1-2 left diagonal, 3-4 straight, 5-6 right diagonal. The ball then travels D6 squares in said direction. Star Player Points: Both DB7 and VB7 are very demanding games. To represent this the SPP are slightly modified. Completion [COMP]: a player who makes an accurate pass or a transmission which is caught directly by the intended target earns 1 SPP. Salvage [SAL]: a player who directly catches an inaccurate pass or a scatter (but not a rebound) earns 1 SPP. Interception [INT]: a player who successfully intercept a pass earns 2 SPPs. Most Valuable Player [MVP]: One player randomly selected among the three players chosen by each coach is awarded 5 SPPs a the end of the game. Acrobatie: A special skill of the kislev team correspond to very long legs. Swoop: Same except that it is now a possible mutation. Secret Weapon: Not only the ref but the whole crew, the captain, the spectators and every one is looking for those. Such a thing could cost the lives of everyone on a boat. No chance of bringing any of those things on a boat without being thrown overboard. Pilling On: to be discussed at the start of the next league. 2 - Black Ice: Slippery ice means that all players may to Go For It one extra time per turn. Hard falls provide a +1 bonus to all injury rolls. 3 - Cold snap or Cold Rain: Numb fingers impose a -1 modifier for all attempts to pick up, transmit, catch or pass the ball. Threat of hypothermia imposes a -1 on rolls to recover from being Mildly KOed (4+). One cannot recover from a serious KO by this weather. 4 - Wind: Roll a D8 to determine the direction of the wind. Each time the ball is scattered move it first of one square in the wind direction and then scatter it normally. All passes suffer an additional -1 modifier. 5‑9 - Spume, Sea spay or Light rain: Perfect Drakkar Bowl weather. 10 - Snow drifts (and light Snowfall): Soft piles of snow forms throughout the pitch, potentially breaking the fall when players go down provide a -1 modifier to all injury rolls. However, the snow imposes an additional -1 modifier on all rolls made to GFI. 11 - Heavy Snowfall: Wind and flying snow reduces visibility to almost nothing. Reduced visibility imposes a -1ST to all blitz. All short, long and long bomb passes are inaccurate (unless they were fumbled). 12 - Hailstorm: The hail imposes an additional -2 modifier on all rolls made to GFI. Long and long bomb passes are impossible. Even other players are harder to see, adding +1 to all Dodge rolls. 2 - Get the ref: Each team receives 1 additional Bribe to use during the game. A bribe allows you to attempt to ignore one call by the referee for a player who has committed a foul to be sent off. Roll a D6, on a 2-6 the bribe is effective (preventing a Turnover if the player was ejected for fouling) but on a roll of a 1 the bribe is wasted and the call still stands. Each Bribe may be used once per match. 3 - Mutiny: If the receiving team’s turn marker is on turn 6 for the half, both teams move their turn marker back one space. If the receiving team has not yet taken a turn this half both teams’ turn markers are moved forward one space. Otherwise roll a D6. On a 1-3, both teams’ turn markers are moved forward one space. On a 4-6, both team’s turn markers are moved back one space. 4 - Defensive shift: The players on the kicking team are allowed to move up to a total of 7 squares, divided among them as the coach decides. No single player may move more than 3 squares. This is a free move and may be used to cross the Line of Scrimmage. 5 - Perfect offense: The receiving team’s coach may reorganize his players (the new setup must still be a legal setup). 6 - Cheering fans: Each team rolls a d6 and adds their FAME modifier and number of Cheerleaders. The team with a higher score gains a Team Reroll. In the case of a tie, neither side gets a reroll. 7 - Changing weather: Make a new roll on the Weather table. Apply the new Weather roll. If the new Weather roll was a ‘Spume’ result then a gentle gust of wind makes the ball scatter one extra square in a random direction before landing. 8 - Brilliant coaching: Each team rolls a D6 and adds their FAME modifier and number of Assistant Coaches. The team with a higher score gains a Team Re-roll. In the case of a tie, neither side gets a re-roll. 9 - Quick snap: The offence start their drive a fraction before the defense is ready, catching the kicking team flat footed. All of the players on the receiving team are allowed to move one square. This is a free move and may be made into an adjacent empty square, ignoring tackle zones. It may be used to cross the recievers line of scrimmage. 10 - Blitz! : The kicking team receives a free ‘bonus’ turn: however, the coach may only choose three players to perform an Action. The kicking team may use team re-rolls during a Blitz. If any player suffers a turnover then the bonus turn ends immediately. 11 - Seagulls: Pass are hindered by the damn birds imposing a -1 modifier and all pass attempts this drive. 12 - Huge wave: All players are move of D3 squares (rounded up) in the same D8 direction. Players pushed out of the pitch go in reserve. Dakkar Bowl 7’s is a lightweight variant ruleset inspired by the Blood Bowl 7’s family of variant rules. Due to editorial oversight, certain rules from the CRB or Living Rulebook 6 may turn out to work completely contrary to the spirit of Dakkar Bowl 7’s, even if the rule has not been explicitly changed. In such situations, players are encouraged to use their best judgement in bending the rules as written to conform to the spirit of Dakkar Bowl 7’s. If a dispute arises as a result of this, a dice roll to settle the dispute of rules bending is preferable to falling back on a rule that is patently incompatible with the intentions of Dakkar Bowl 7’s. Looks interesting, and thank you for posting! Are the team rosters and position quotas the same as in Blood Bowl? So Humans could still field 4 Blitzers? Any team can field up to 5 positionals in the limit of their BB11 roster. So yes, with 7 players humans could field 4 blitzers. And they could add a receiver or an ogre as their nineth player. Right, half the team has to be linemen. That's a pretty big change for some teams - Lizardmen come to mind. Starting roster looks like 4 Saurus and 4 Skinks, and getting a Kroxigor means one less Saurus. 0-6 positionals are meaningless. The Human Alliance team looks very interesting and it seems to me to be really good - better than any of the component Human teams, because there's just such a range of options. Even the different linemen can be specialized - "Kislev" or Norse linemen are basically half a Blitzer, etc. We can try this some time. It does not change that much. In BB11, If you play with 6 saurus (5 saurus , 1 krox) + 5 skink, you have a 54.5% bash team. If you play as you suggest in DB7: 4 saurus (3 saurus , 1 krox) + 3 skink (and one skink bench), you have a 57.1% bash. So the ratio is similar. Yeah they are fun but the double limitation, 1) half the team must be linemen and 2) you can not have more than 2-3 players of one nation avoid any abuse. It is good but I believe it is on par with the tier 2 teams. The great thing is the little "secret league" feeling that you get and the many flavours you can play this team. I like to use the ST4 (wolves) and AG4 (kislev catchers) so I can't take those nations as linemen. On the oposite, some play with amazon, bretonian and/or empire blitzers and can take norse and kislev linos. Some mix or like to start with the cheap bretonnian peasant so they can buy more expensive positionnals. The versatility is amazing but we have not yet identified a starting roster which would make it overpowered. Still, the tiers are made for short leagues. If you play on a longer period they are definitelly not adapted. Nurgle or Kislev or at a lesser proportion alliance would be too advantaged. PM me when you like. Let's organise a test game and then we'll see. Just read the rules, sounds like fun. It is. The smaller pitch gives player positioning a great importance. It's a great version of the game. And it has a huge advantage. You can play a game in a bit more than an hour. For those who want to try by themselves. Every one interested to try it please send me a personnal message. We'll organise friendly games. You can write in german (try to avoid too much bavarian). I can read and speak. I just can't write it. Is there a link to the 7s rules ? I will check obblm settings to see whether I could set that um in pur league management system. Is that the rules version you use ? Not exactly. We use something very similar but we changed a couple of things. We picked some things from the BB7s rules, some from the beach bowl rules. a) We integrated the possibility to play on a beach bowl pitch for more variety. In my rules above the traditional BB7 pitch goes by the name Drakkar Bowl (DB7) while the beach bowl pitch goes by the name Viking Brawl (VB7). b) to accomomodate that we use a slightly modified GFI rule (see above). c) we also don't use the normal passing range with modifier (as in the NAF version) because none of the BB7 pitchs are made by the same manufacturer (some have 29mm, 30mm or 34 mm squares). Instead, to be sure the games stay homogenous, we count the squares for pass (see details above). d) Finally, we like to play short leagues because life is constently evolving (kids change school, we change work, move, etc...). Some races are favorised by the short leagues. So we decided to integrate the tier ranking used for the dornbirn WM. Said tier system is though for tournament and adapt quite well to our rosters rules and tournament. This way we can still rotate the teams and have fun. e) Their might be some other differences. All details are written above. We don't have the ambition to make a NAF certified league. We just want to play in the little free time we have available and have some fun. Is there a high resolution version of the pitch ? Like, to print out for use ?